Band of Bohemia is aiming to open Nov. 19, and it'll be serving Dark Matter in the a.m.
RAVENSWOOD — Attention Metra riders: Your morning commute is about to get more conveniently caffeinated. 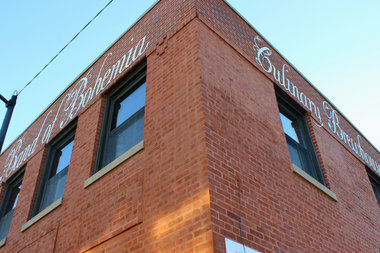 Band of Bohemia Culinary Brewhouse, a stone's throw from Metra's Union Pacific North line at 4710 N. Ravenswood Ave., is aiming for a Nov. 19 open. And while owners Craig Sindelar and Michael Carroll have previously touted the restaurant's beer-food pairings, the location all but begged for coffee service too. RELATED: Band of Bohemia Aims To Open by November, Are You Ready for Beet Beer? Alinea vet Tom Santelle has been brought on board to head up Bohemia's coffee program, which will feature beans roasted exclusively by Dark Matter. The brewhouse will open 7 a.m. to 2 p.m. Monday through Saturday for to-go java jolts. For evenings, Santelle is in the process of crafting coffee and tea offerings that will complement Bohemia's dining options, in the same way that Carroll and executive chef Matt Dubois are coordinating beer-food combinations. "We have very expressive food and very expressive beer," Santelle said in a statement. "I'll be using coffee and tea to specifically complement the food or the beer, course by course."